Make sure you OPEN all the photographs which ENLARGE as they form part of the visual description.. Quality 1893 Chinese Repousse Chinoiserie Gilt Silver Scent Perfume Bottle 4. Colours may differ due to any flash used or your computor settings. If its a similar weight and destination. Hold me responsible when leaving feedback or DSR ratings. Here is an antique English Victorian gilt sterling silver repousse work scent perfume bottle. It has a threaded internal top and a cork on the underside of the spherical top. There is a 3 initial MONOGRAM engraved on the lid. The screw threads are very good under the lid. 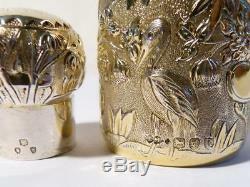 The design is repousse work and it is really beautiful very much like the Chinese Export silver of this period.. It is full of detail everywhere and all gilt as well. With plain silver at the top shoulder and just on the collar of the bottle top. It has a vacant cartouche at one side with the bamboo stems coming from it and a large CRANE bird at both sides..... Hallmarks are on the plain band of the domed lid as well as at the bottom of the main flask below the Crane. Frederick Bradford McCrea, Army & Navy Cooperative Society Ltd. The bottle is 8 inch tall x 1 and 5/8ths inch x 1 and a 1/4 inch base and it weighs approx..... See a similar larger scent perfume flask also listed today. See close up photographs for more details and condition. The item(s) are shown next to an English 1 penny which is 20mm dia for scale. 2.5cm = 25mm = 1 inch. Once an item is the in the postal system any delays are out of my cont rol. See the date it was sent. On all items sent back to me in the condition you received it in. Please note the items I sell are antique or vintage and as such have been around for many years, they will show signs of use & wear and whilst I will describe condition to the best of my ability, everyone has a different idea of condition. Auctiva Offers Free Image Hosting and Editing. Attention Sellers - Get Templates Image Hosting, Scheduling at Auctiva. The item "Quality 1893 Chinese Repousse Chinoiserie Gilt Silver Scent Perfume Bottle 4" is in sale since Wednesday, January 3, 2018. This item is in the category "Antiques\Silver\Solid Silver\Bottles". The seller is "diggerlee" and is located in SCROLL DOWN FOR LARGER PHOTOGRAPHS.